On a rainy day in New England, Boston-area alumni and family held a day of service at Franciscan Hospital for Children, a national leader in caring for children with special health care needs. 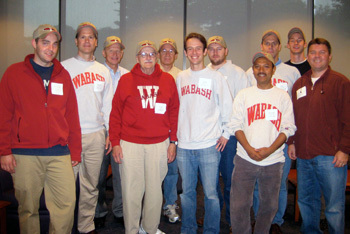 Wabash men visited with children from two of the residential units, a psychiatric ward and the Community Based Acute Treatment (CBAT) unit. The CBAT unit houses children with special emotional and behavioral needs, many of whom are in state custody, and sees them through a short stabilization and assessment period.